Sweetly B Squared: Bookstock - Used Book and Media Sale! Bookstock - Used Book and Media Sale! The kids and I visited Bookstock yesterday! I really wanted to go to one of the days with extra freebies, because FREEBIES! !, but our schedule just wasn't going to allow it this week. 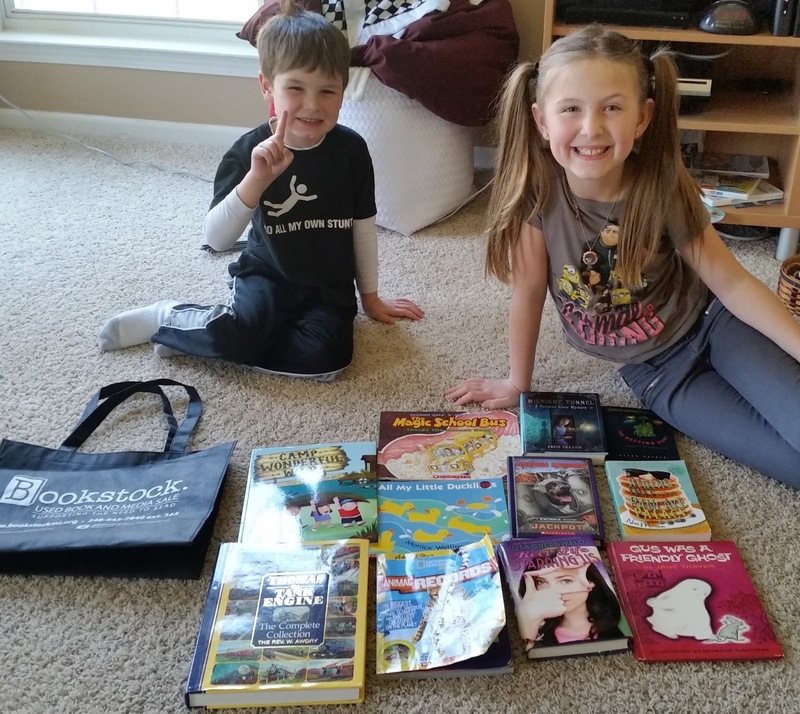 So our reward for getting the house cleaned up was heading to Bookstock, where they each got to pick out five new (to them) books. I was originally worried about the opening day crowds, and gave the kids the 'if we're separated' speech on the way, as well as establishing a meet-up spot once we arrived. None of that was necessary. We got there around 1pm and didn't have many crowd issues. The actual tables to look were crowded, but you could usually work your way in. Here's the kids with their treasures. The giant Thomas collection is on its way to school today with our resident 'child-of-the-day.' I'm sure he'll give his plug to how fun Bookstock was while he's there. Monday Madness (Apr 24): Buy a book and WIN! Giveaways while supplies last! Love books! So glad the littles have picked up on that love. Enjoy!! Oh, how I remember my days at Laurel Park mall and bookstock. I still miss living over there. I have heard so much about Bookstock! I'll have to make a special trip out for the next event. We loooove books!! This is amazing!! I so wish we had something like this near me. I usually rely on the thriftbooks website. I definitely need to check out Bookstock one of these days! We LOVE books in our home and I could spend a lot of money there if I wasn't careful!